Celebrating a friend's birthday we decided to try out Third Chapter, a recently renovated cafe/restaurant in Eltham. Kim our waitress was a great host, she made us feel so welcome and recommended a few dishes off the menu. The atmosphere is warm and inviting. A modern cafe with an option to sit on comfty lounge chairs, if they are not already taken! The place is always buzzing and the dishes that were being served looked amazing. We all decided to go with the burgers. As a vegetarian, the grilled mushroom was filling and tasty. All burgers come with a side of battered fries. I ordered the sweet potato fries which were nice and crispy on the outside. 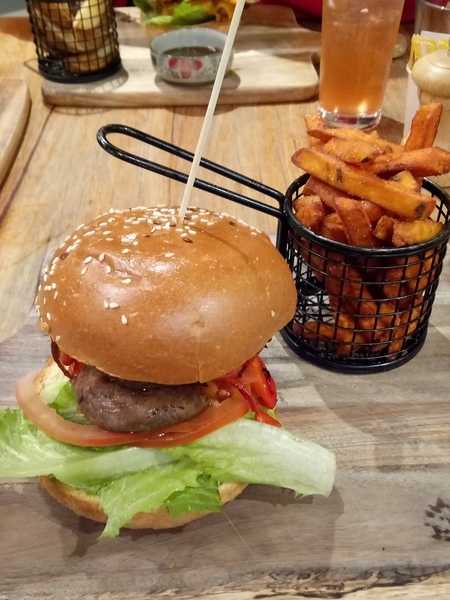 The bun was soft and toasted with char-grilled roasted capsicum, cheese and lettuce. Can't wait to try out their other dishes on the menu! Third Chapter's menu combines the best of local and seasonal ingredients. They also cater for private functions! Open 7 days a week till late.